I met Alison McQuade 15 years ago. She wanted me to try her chutney and invited me to meet her at a local wine bar. At that time she was on the verge of quitting her day job and becoming a full time artisanal food producer. While to this day she doesn’t describe herself as a cook, she has mad skills when it comes to chutney. She is also quite a wonderful person and we quickly became friends. Over the years I have bought McQuade’s Celtic Chutney to give as gifts, made recipes using her various varieties of chutney and been an all around fan of her products. 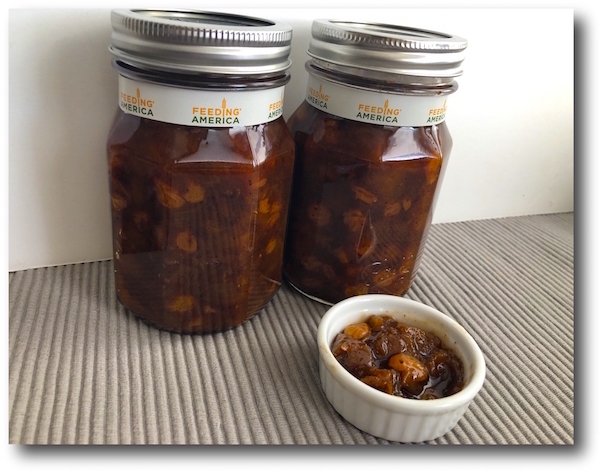 Faced with a box full of peaches this year supplied to me by the Washington State Stone Fruit Growers, I knew I wanted to make chutney but couldn’t imagine just turning to any old recipe. So I called on Alison for some guidance. Her recipe uses weights, so if you don’t have a digital scale, please use this as the excuse to buy one, they are not expensive and are essential for baking. The one I currently use is a SmartWeight model that cost less than $20 and displays pounds, ounces, grams and milliliters. You’ll note the chutney is in Ball jars for gifting, and the company that produces them makes a donation to Feeding America for every package purchased (up to $150k). Alison has a keen sense of what flavors will go together and balancing heat, acidity and sweetness. Her chutneys are always chunky, fresh tasting and highlight the fruit. They are not goopy, gloppy, too sweet or sour and always have just the right amount of zing. This peach chutney is particularly wonderful. It uses a mixture of different vinegars and classic spices, fresh ginger, cinnamon and allspice. If you’re wondering how to use chutney, it’s terrifc with cheese of course, but also on sandwiches, with stews and curries on sausages or chops, or mixed in chicken salad. Honestly I could eat it straight out of the jar with a spoon! Note: This recipe makes 3 pints, but you can easily use 6 half pint jars if you prefer. The recipe can easily be doubled or tripled if you want to make a bigger batch. Fill a canner with water and bring to a boil. Add the peaches to the water and cook for about a minute then transfer the peaches using a slotted spoon to a boil with cold water. Peel and coarsely chop the peaches and set aside. Place the jars in the canner and boil for 10 minutes. In a large stock pot combine the onion, vinegars, sugar, ginger, salt, cinnamon and allspice. Bring to a boil then simmer, stirring occasionally until reduced by half, about 15 minutes. Add the peaches and stir occasionally, adding golden raisins after about 15 minutes, continue cooking until tender and jam-like about 30-40 minutes total. Chutney will thicken further after being processed. Lift the jars out of the canner, pouring the hot water back into the canner. Ladle the chutney into the jars, leaving 1/2 inch headspace. After filling the jar, release the air bubbles by inserting a narrow silicone spatula or similar tool between the chutney and the inner surface of the jar. Place the rims on top of each jar and loosely seal with the bands. Carefully place the jars back in the canner and boil for 15 minutes. Remove from the canner and let rest overnight, you may hear the lids pop. Store for up to one year. Disclaimer: A special thanks to Alison McQuade for helping with the recipe. Peaches were provided to me as part of the canbassador program by Washington State Stone Fruit Growers and to Ball Home Canning for the jars. This post includes one affiliate link. ©2018 Cooking with Amy. All rights reserved. This material may not be published, rewritten or redistributed without permission.